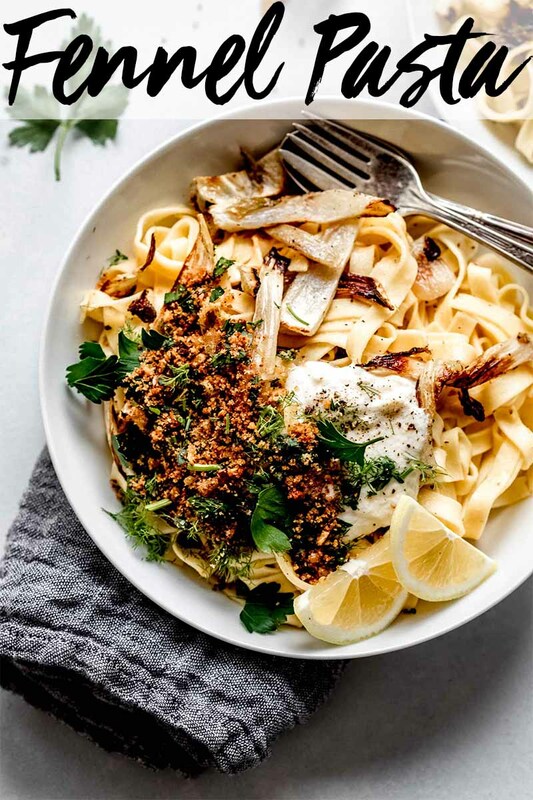 This Roasted Fennel Pasta recipe features fresh linguine tossed in a light lemon sauce with roasted fennel. It’s topped with dollop of ricotta cheese for extra richness. Fennel is quickly becoming one of my favorite ingredients, but I was a bit hesitant to use it at first. When most people describe fennel, they say it tastes like licorice. It does, but not overbearingly so. With its light anise flavor, it melts into a savory sweetness when slowly cooked, which is how I prepared it the first time around with this Sausage & Fennel Ragout with Creamy Polenta recipe. It slow simmers spicy Italian sausage, with fennel and white wine. The result is a fabulously salty/sweet/spicy combination. And, to date, it’s still one of the recipes I get asked for most by those who’ve tried it. After that first fennel experiment, I got my courage up to try fennel raw. I was a bit more timid to try fennel this way because I thought it would be extra potent in its natural state. Not so when it’s thinly sliced. This Fennel & Celery Salad is crisp and refreshing, with a bit of saltiness from the parmesan and a blast of buttery flavor toasted pine nuts. The flavors all play really nicely together. It’s amazing served with meat-based dishes or creamy casseroles because its bright flavors and light acidity help to cut through the rich flavors. With this fennel pasta dish, I took on a new way (for me) to serve fennel – Roasted. 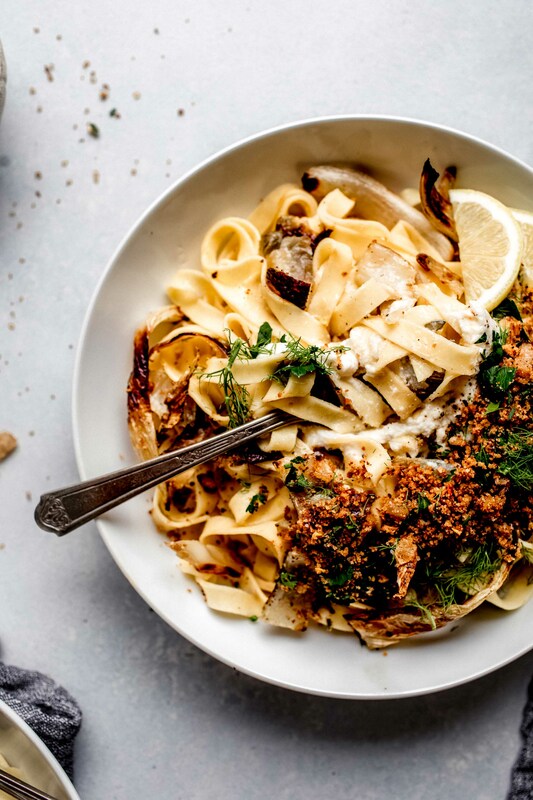 Baking fennel at a high heat gives it a nutty, caramelized flavor – A perfect compliment to the zesty lemon sauce that we’re tossing it with and serving over fresh linguini, topped with toasted breadcrumbs and a dollop of ricotta cheese. Yep… Yum. Crunchy, creamy, tangy. Plus, we’re garnishing it with the fennel fronds – The frilly little leaves, that look like dill, growing off the stocks of the fennel. Yep, fennel comes with its own garnish, how cool is that? I’m may just be in food love with this dish… And fennel. I love fennel, lots and lots of fennel. Trim off the fennel stalks to where they connect to the bulb. Save the leafy fronds for garnish. Cut the bulb in half and trim the root end. Cut the halves into quarters. Cut each quarter at an angle to remove the core. Starting at the top of the bubl and working towards the root, slice the fennel into strips. To roast fennel, cook it in a 450-degree oven for 20 minutes, tossing halfway through. 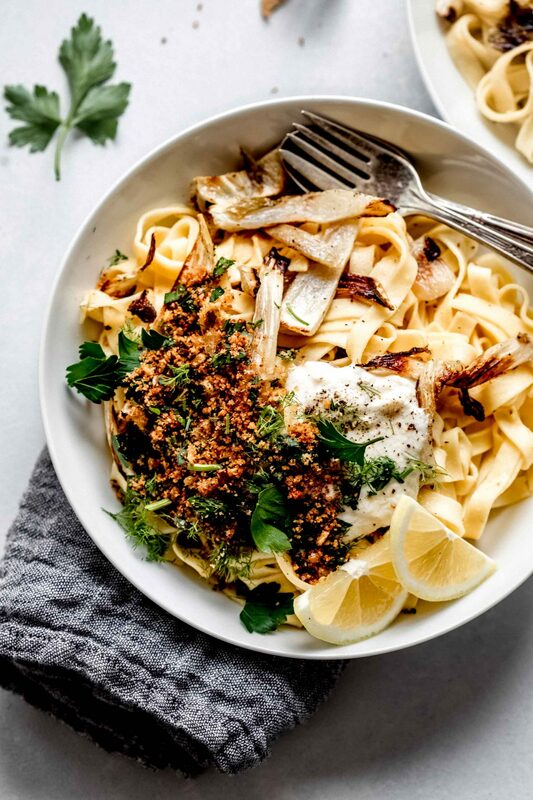 This Fennel Pasta recipe features fresh linguini tossed in a light lemon sauce with roasted fennel. It's topped with dollop of ricotta cheese for extra richness. Pick off and mince a few of the fennel fronds. Cut off and discard the fennel stems. Halve and core the fennel bulb; slice into ½-inch-thick strips. Place the sliced fennel on a sheet pan, drizzle with olive oil and season with salt and pepper; toss thoroughly to coat. Arrange in a single layer and roast, 18-20 minutes, tossing halfway through, until tender and golden. While the fennel roasts, combine the ricotta cheese and the juice of 2 lemon wedges; season with salt and pepper to taste. In a large skillet, melt butter over medium heat. Add garlic, shallot and half the parsley. Cook until fragrant and softened. Add the breadcrumbs and toast over medium heat, until browned. Season with salt and pepper to taste, and transfer to a small bowl. Wipe out the pan. In the now clean skillet, combine lemon zest, juice of remaining two lemon wedges, ½ cup water, and 2 tablespoons olive oil; heat to boiling on high heat and stir to combine. Remove from heat. Boil the pasta until just short of al dente. Reserving ¼ cup of the pasta cooking water, drain the pasta and add it to the skillet of sauce. Add the roasted fennel, minced fennel fronds and reserved cooking water. Cook on medium-high, stirring occasionally, until the pasta is well coated in the sauce. Remove from heat and season with salt and pepper, to taste, top with breadcrumb mixture, a dollop of the ricotta mixture, and remaining chopped parsley. 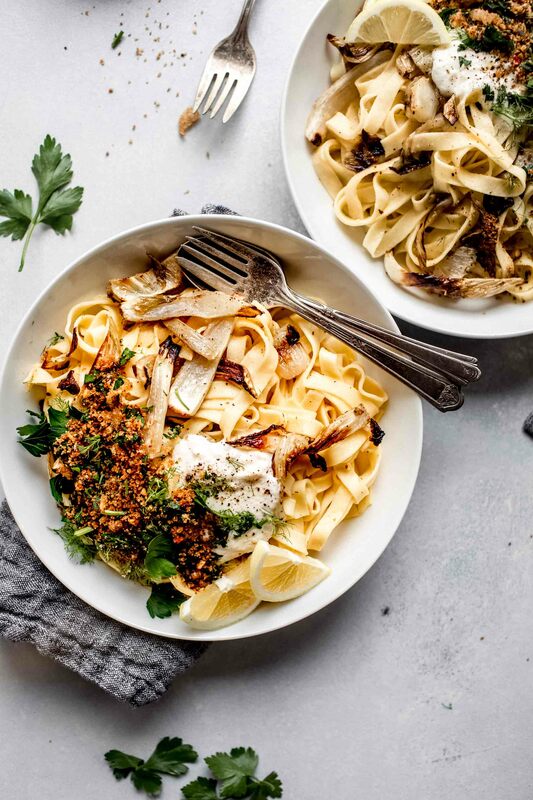 If you loved this Roasted Fennel Pasta recipe I would appreciate it so much if you would give this recipe a star review! Also, be sure to snap a picture of your finished dish and share it with me on Instagram using the hashtag #platingsandpairings and tagging me @platingsandpairings. Sauvignon Blanc pairs very nicely with the lemon flavors and grassy notes of the fennel. Pinot Gris is another great match – With bright acidity and notes of citrus, it’ll pair well with the rich breadcrumbs and ricotta topping. 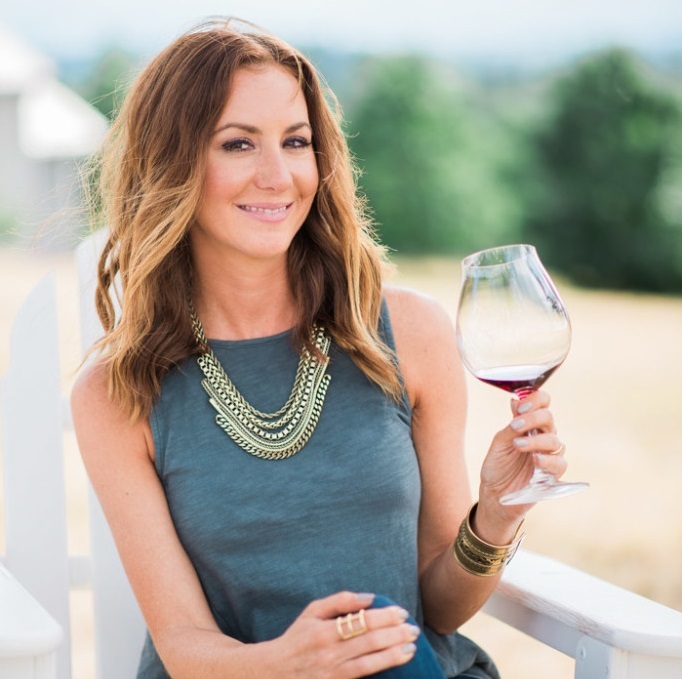 Dry Riesling – My go to food-friendly wine. It’s light sweetness will echo the flavors in the roasted fennel, yet not overpower this delicate dish. Yum, this recipe sounds delish. I love lemon in pasta too. And your photos make this look to die for! I keep reading recipes including fennel. Perhaps it will be the kale or pork belly of 2016! Meredith – At IFBC this year, they said that Cauliflower is going to be the Kale of 2016 – But I think it should be fennel! I have to say I’m not usually a fennel fan. Pickled fennel has been growing on me though. 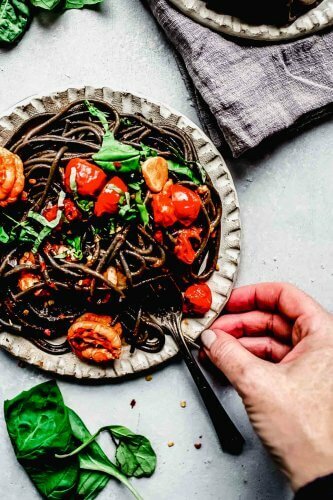 And this pasta dish looks incredible so I would probably put my licorice feelings aside to try it! Erin – I’ve never heard of pickled fennel – That sounds SO good! I need to find some! I’ve also never cooked with fennel as some of the commenters above me said, but I’ve ordered dishes in restaurants and always loved the flavor. These pictures are beautiful and make me want to try it! Guess its time to cook with something new! Ooohhh – You should definitely try cooking with it this fall Rachel! Love it! I think it’s a bit misleading to say that it has a licorice flavor, but there’s really no other way to describe it I guess. SO good though! YUM!! I am not normally a fennel fan either, but that’s mainly because of the texture. 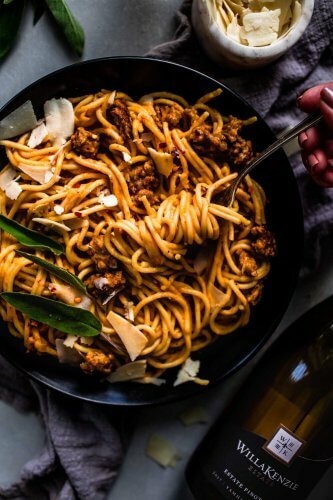 I love the flavor it can add to pasta dishes, and your recipe sounds divine! I am a fennel addict and cook with it a lot. I had to make a conscious effort to not use it too much on my blog since I already have a couple of posts with it! The licorice flavor really tones down when it’s cooked, but I like it raw, anyway. I agree on all of those points Salvatore! At first I was a bit timid to eat it raw, but it’s delicious that way as well! This is my third fennel post on the blog in a little over a year – We can be addicts together! 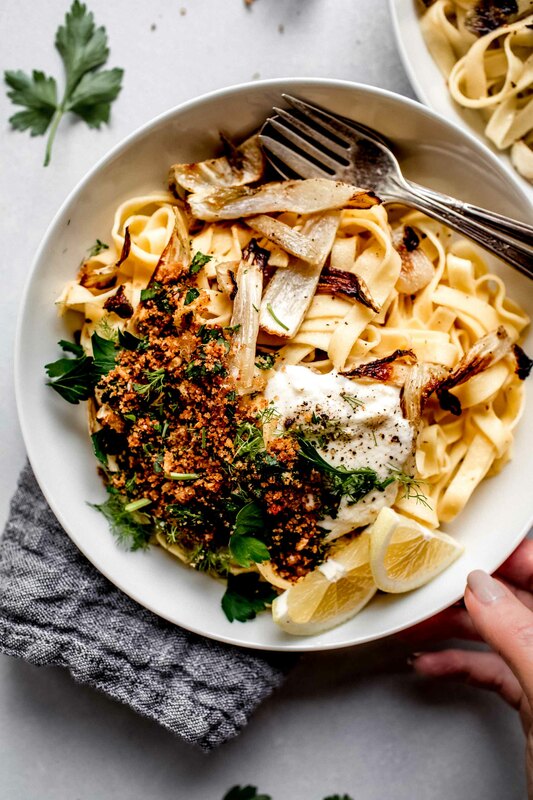 I LOVE the flavor of roasted fennel – this pasta sounds amazing! Thanks Kristina! I’m a huge fennel fan too! I can’t get enough of it!!! Of course Crystal! I hope you love it. I also love this Sausage & Fennel Ragout, and this Fennel & Celery Salad, both featuring fennel. I’m such a timid cook– in step 5, what do you do with the breadcrumbs and cooked garlic, shallot and parsley after you wipe the pan? When does it get added back? And is the other half of the parsley for garnish? Hi Heather. I’ve revised the recipe to be a bit more clear. Thanks for catching this! 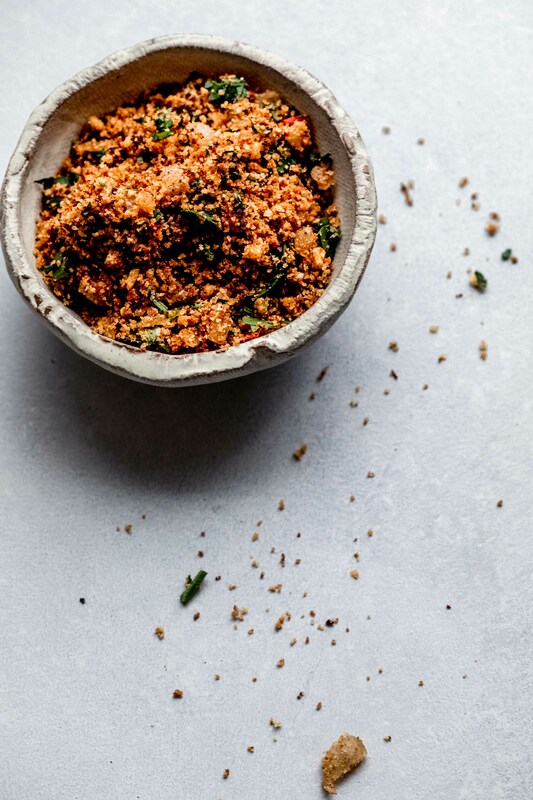 Once the breadcrumbs are cooked, set them aside in a small bowl. 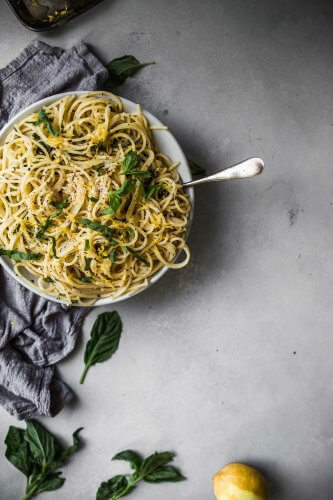 After the pasta is cooked together with the sauce, you’ll top the bowls of pasta with the breadcrumb mixture, the remaining half of the parsley, and a dollop of ricotta. Hope this helps. Please feel free to let me know if you have questions. I’d LOVE to hear how you like it! I cooked this dish today, just one word YUM! So glad you enjoyed this Fran! I reduced lemon in the half than original recipe. Still the only ingredient you cat taste was lemon. Fennel after roasting has no taste at all . Some kind of roasted vegetable. You can roast anything to get the same result. So much effort. Very disappointed.. Very tasty! 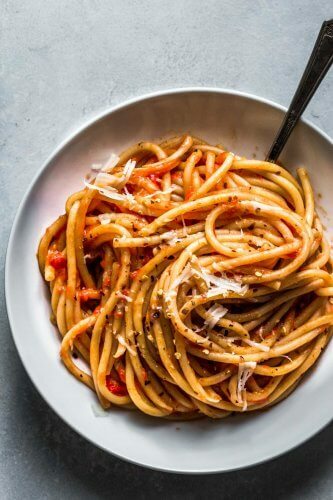 I ended up not being able to find fresh linguini at my grocery store, so had to eye ball with the dry and from the packet linguini, but loved it! Also, my grocery store was out of fresh parsley so I had to use parsley from a tube. However, I will be making it again with hopefully more of the correct ingredients! Thanks for sharing! And this was my first time making or eating fennel (to my knowledge)! I came across this recipe in a search for a vegetarian friendly fennel recipe after buying some at my local farmer’s market. I’m so glad that you liked it Mel – It sounds like your substitutions worked just fine! I love using fennel in cooking and even raw in salads. i wanted to suggest using Nuttelex or Earth Balance instead of butter and maybe silken firm tofu instead of ricotta (it’s nice and squishy but crumbly like ricotta). It’s so good. I can’ t wait to make it for my family and friends. Just made this recipe tonight. So, so, so good!!! I used full fat ricotta cheese because the taste is just so much more worth it than the low fat varieties. I also used two fennel bulbs, so our ratio of fennel to pasta was much higher (we love fennel in our house). Even my 2.5 year old was a fan (which was a nice and welcome surprise). Thank you for the recipe! Will be added to our regular menu! I’m so glad you liked it! I’m with you, I’m a total fennel fan too! I may take your suggestion and up the fennel ratio next time!